A mysterious castle has appeared in the skies above Yoshi's Island, and Toadies have kidnapped all the children from the island's nursery. Baby Mario escapes his kidnappers and finds his Yoshi friends. They agree to cross Yoshi's Island and rescue the babies. As you progress, you will find other babies and can switch between them at Stork Stops. Baby Peach can float with her parasol and Baby DK can climb on vines. You can also play with Baby Wario and Baby Bowser on certain stages. You can score 100 points in each level by finding 5 Flowers, 20 Red Coins and a full 30 stars in your Star Meter. 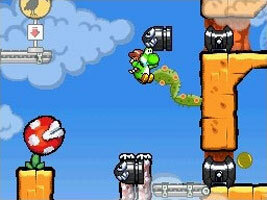 Each level also has a Baby Coin that can only be collected by a particular baby.